"Kind and courteous office staff. Very professional doctor." "Good caring doctor who you can trust." "Dr. McAlpin actually listens to you and goes out of her way to help." "Very thorough, professional, and a pleasure to work with. Highly recommended." "I am so happy I came here! Dr. McAlpin is amazing!" "Very good otolaryngologist. I could not have been happier with our experience." "Two months since my surgery and I am extremely pleased and grateful for Dr. McAlpin!" "Clean and welcoming office environment. I will most definitely be back." Christina M. McAlpin, MD, FACS is a Harvard-educated otolaryngologist and surgeon who is passionately committed to improving the health of children and adults of all ages in Los Angeles. Dr. McAlpin has extensive experience in emergency pediatric surgery and facial reconstruction. She also has a special interest in correcting voice disorders in singers, actors, and others who use their voices professionally. After receiving her undergraduate degree at Harvard University in Cambridge, Massachusetts, Dr. McAlpin earned her MD at the University of Southern California Medical School in Los Angeles. She received her general surgery training at Cedars Sinai Medical Center in Los Angeles and her otolaryngology surgery training at the University of Chicago. At Cedars Sinai, she was the assistant course director of ENT Disorders For Non-ENT Physicians. She is now one of the faculty members for the course. She's a member of the Cedars Sinai Center of Excellence (COE) for Sinus Surgery. Previously Director of Chief of Surgery and ENT Trauma at California Hospital, she now serves as their Vice Chief of Staff. 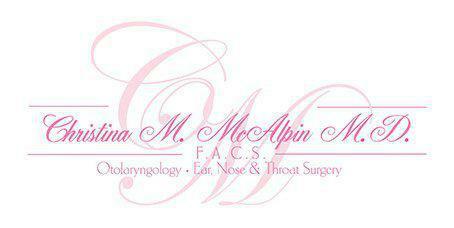 Board-certified in otolaryngology, Dr. McAlpin sits on the Tonsil Subcommittee of the American Academy of Otolaryngology. She is also a Fellow of the American College of Surgeons (FACS). In addition to helping her patients, Dr. McAlpin is an educator for the Ross Medical School, Charles Drew NP Program, and the University of Southern California Family Practice Program. She loves to do outreach and education for local schools and communities, working with schools, parent-teacher programs, and health fairs to increase awareness of ENT health throughout Los Angeles. "Great Doctor, she was thorough and quick. Her explanation was easy to understand. It was my first visit and I was in and out in less than one hour." "Dr. McAlpin is a lovely doctor. She listened thoroughly and explained exactly what was going on with me. Really happy with her as my ENT. Would recommend to anyone." "Dr. McAlpin seemed sincere and genuine. I highly recommend her. The front desk staff were courteous and fast and everything went smoothly!" "I have never met a kinder, more personable physician in my life. Her staff was absolutely welcoming, very prompt and considerate." "The staff is really friendly and knowledgeable! Dr. McAlpin is so sweet and caring! I would highly recommend her!" "This doctor is fantastic and did an amazing job! My nose works beautifully and recovery was a walk in the park!" "I took my daughter for an ENT consultation, we were a little nervous but the assistants and Dr. McAlpin made us feel very comfortable and welcoming." "I was extremely nervous about the entire process but from my endoscopy all the way up to my surgery, her entire staff was so comforting." "I can finally breath out of my nose and I haven't had an asthma attack in almost six months. She is amazing and I really can't praise her enough."